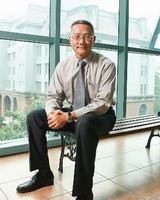 Chi-Ling Pan graduated from Fengchia University in 1983. He received M.Sc. and Ph.D. degree in Civil Engineering from the University of Missouri-Rolla, where he has worked as a post-doctoral fellow of structural engineering. He is currently employed by Chaoyang University of Technology (CYUT) as a professor in Department of Construction Engineering and Dean at college of science and engineering. Professor Pan is also the editor of International Journal of Applied Science and Engineering at present time. His research interests are focused on the areas of cold-formed steel structure, light-weight steel building, and steel scaffold system. He served as vice president of Taiwan Society of Light Gauge Steel Buildings during 2012 and 2013.